My property (Lynx Run) has an amazing geological and historical background. 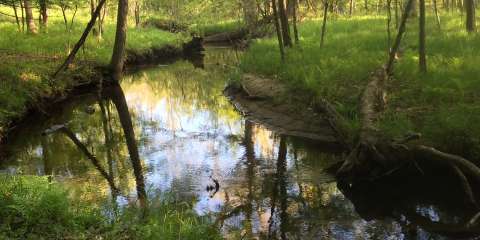 During the last ice age, glacial waters carved out the ravine in which the Betts Creek flows. 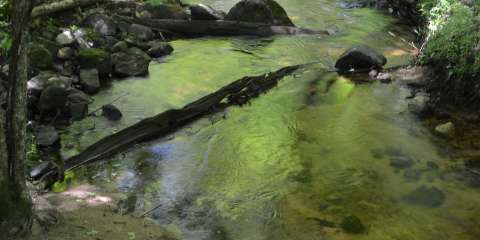 Sometimes, the creek drops over 60 feet below the surrounding terrain as it meanders back and forth in oxbows as it flows toward the Muskegon River. It was once the hunting, foraging and camping grounds of the Potawatami Indians. In the late 1800's it was at the center of the Michigan Timber Industry. Running along the edge of my property is the old railroad bed where timber was once hauled away. Only two miles from my home, the logs were sent down the side of the hill and into the Muskegon River on log chutes and then floated to where the Muskegon empties into Lake Michigan. Piles of field stones indicate that after the timber industry moved on, farmers moved in and attempted to tame the land. But, fortunately for me, the land was abandoned by the farmers and has returned to a much more natural and pristine state. My land is now a part of the Manistee National Forest and I am surrounded by thousands of acres of beautiful land (both public and private). I am the only person who lives back here in this part of the forest, so seclusion and privacy are wonderful and the wildlife and beauty is abundant.